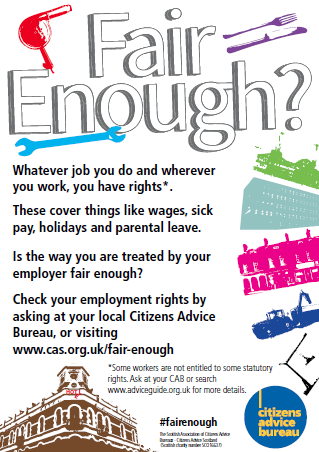 In the first months of 2015, Citizens Advice Scotland and Citizens Advice Bureaux highlighted unfair employment practices, and reminded workers of the rights they have. These pages remain as a vital resource for employees who may not be getting a fair deal at work. Every day, CABs across Scotland see clients who have encountered a problem at work. Among them, issues with unfair dismissal, pay, sickness entitlement, holidays, parental rights and bullying are common. Fair Enough? aimed to reinforce the messages that employees should be protected at work, and that there is legislation to help them. The campaign heralded the publication of a new report and a Scotland-wide drive to help employees assert their rights. Throughout the campaign, CABs undertook local activities and displayed Fair Enough? materials to spread the message.